The science: H2O is, of course, water. H2SO4 is sulfuric acid, a highly corrosive acid. It’s a clear liquid just like water, so it’s no wonder poor Johnny got them mixed up. 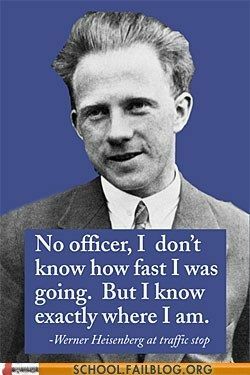 Heisenberg argued that you can know either the precise location or the precise momentum of a particle, but not both. Even though this sounds like our measuring tools or technology is limited, the Heisenberg principle actually means that you cannot measure (no matter how good your technology is) the precise location or momentum of a particle. This shirt, from Snorg Tees, mixes science with geekery. In physics, the force of an object is equal to the mass multiplied by the acceleration of the object. Therefore force = mass times acceleration. This image simply replaces “May the FORCE be with you,” from Star Wars with mass times acceleration. If an electron has more positrons than electrons, it has a positive charge. This joke takes advantage of the double meaning of “positive,” meaning both “positive charge” and “are you sure?”. 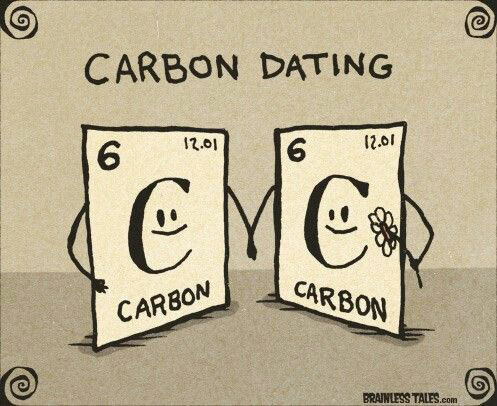 While it looks like these two carbon elements are out on a date, carbon dating is a method to estimate the age of organic materials. How it works: plants absorb carbon dioxide. But there are actually two types of carbon: carbon-12 and carbon-14 . Carbon-12 is ordinary, stable carbon. Carbon-14 has two extra neutrons and is a bit unstable. Eventually, carbon-14 will lose those two extra neutrons and become carbon-12. 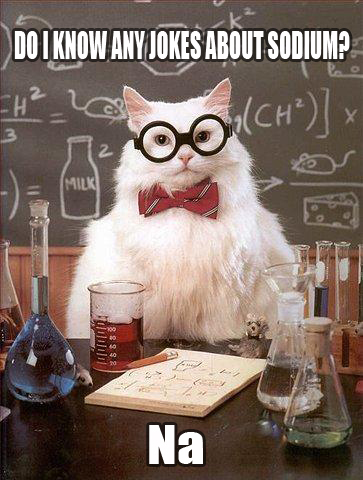 The rate that carbon-14 loses half its neutrons is called a half life. It’s a constant, predicatable time frame (5,740 years for carbon) and so can be used to estimate the age of organic materials like the Dead Sea Scrolls. This joke is twofold: carbon dating can mean “two carbons on a date” or “using the decay of carbon to determine the date of organic materials.” The other line, “where half you been all my life?” sounds like a romantic line, “where have you been all my life?” but also refers to the half life of these carbon-14. All in all, it looks like a rather unstable relationship. This entry was posted in Fun Science, General by Alicia Brown. Bookmark the permalink.